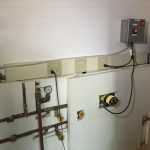 Thanks to Tim Work, a friend and NASA electrician, I no longer have to monitor the attic’s temperature – and turn the Attic Heat Recovery system’s circulation pump on and off throughout the day. Tim assembled a control panel to automate the system for me. 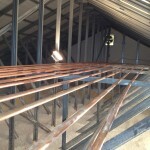 A thermal wire runs from the attic to the garage, where the system’s circulation pump and control panel are located. The thermal wire senses and provide the controller with the attic’s temperature. The controller then turns the circulation pump on and off according to the temperature selected. I envisioned automating the system when I originally designed and installed the system, but didn’t know how to. It’s a relief not to have to deal with it everyday, so it’s something I appreciate everyday. It’s always great when others are willing to contribute.